What is the Get Down or "Git Down" Rope? 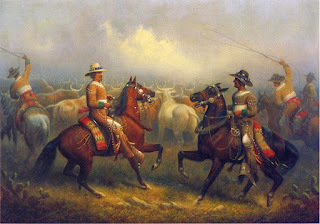 Many working cowboy ranches embrace the traditions of the Old West Vaqueros. of horse training and horsemanship. In keeping with this traditional Vaquero style, the Get Down Rope has become popular with not only the old west working cowboy ranches, but the casual riders following the Vaquero style. The "Git Down Rope " is also very popular in the competitive ranch classes at rodeos and horse shows. These horse competitions demand the use of this rope as well as the Bosalito. The traditional cowboys used the “git” down rope to keep their horse standing still while they “git” down to shut the gate, pick up something or have a few biscuits by the campfire. Today, the Get Down Rope is used in the same way, especially in training young horses to stand still. The Get Down Rope is mostly used under a bridle bit set up. It is never desirable to lead with reins. When you have a “Git Down Rope”, you have a lead rope. A Get Down Rope is not designed to tie up with. The Get Down Rope is used in place of a halter and is easy to use. Watch the HOW TO VIDEO to learn the proper way to attach the old west “git” down rope and the proper, comfortable fit for the horse. The Get Down Rope consists of a Bosalito or Caveson, a light Bosal hanger, and a 16-18" Get Down Rope. Ropes are made out of alpaca, horse hair and marine yacht rope. 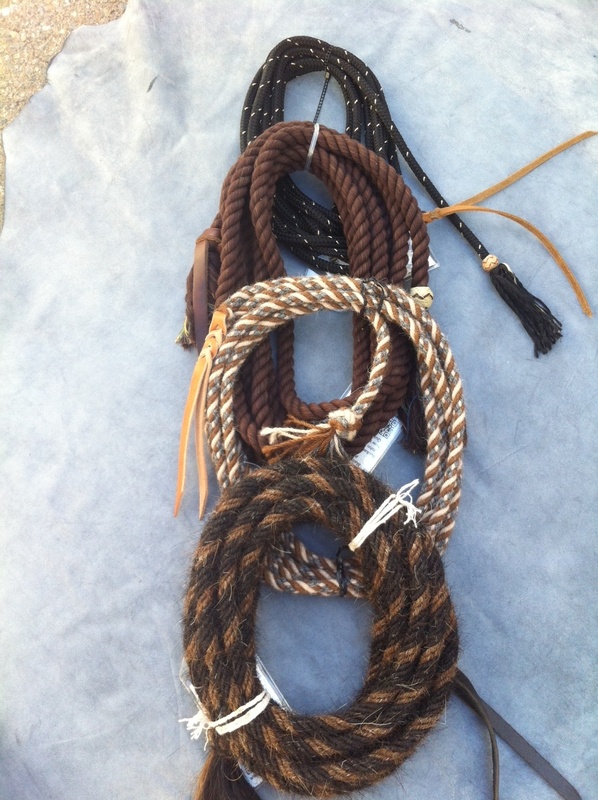 Buckaroo Leather has just the Get Down Rope, in several colors, or the rope with the Bosal and hanger. Git Down Rope 18' long with leather popper. Made from 3/8" Nylon Marine yacht braid with beautiful, natural rawhide button with tassel. Also available in 1/2" cotton with natural rawhide button and cotton tassel. 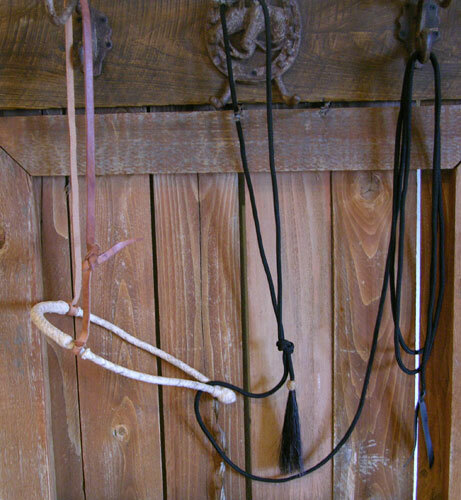 To be used in place of a halter and lead rope with a pencil Bosal and hanger under a bridle for leading. When you "get down" you have a lead. If you need the Bosal also, see below, L505comp. Git Down Rope and 3/8" Pencil Bosalito with 1/2" harness leather hanger headstall (complete set as pictured), Get Down Rope is 18' long with leather popper, made of 3/8" nylon marine yacht braid with beautiful, natural rawhide button with tassel. Also available in 1/2" cotton with natural rawhide button and cotton tassel. 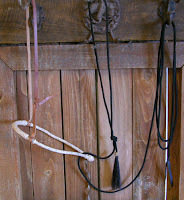 To be used in place of a halter and lead rope with a pencil Bosal and hanger, under a bridle for leading. When you "get down" you have a lead. Pencil Bosalito is 3/8" and 12 plait beautiful, all natural rawhide braid w/rawhide core. Our family has been dedicated for 30+ years in serving the Western Horseman with the safest, most durable Quality, American made leather horse tack....... Buckaroo John Brand - Buckaroo Leather, The Brand to Demand!